Sometimes the easiest and most satisfying dinners are the result of a major assist from a store-bought item. I, for one, fell in love with these personal-sized, thin pizza crusts. They are (coincidentally) named Mama Mary's Gourmet Thin & Crispy Pizza Crusts and I just started noticing them at our local grocery stores. They taste delicious and are made with honey. Plus, each 7-inch crust only has 8 grams of total fat, 1 gram of saturated fat, 300 mg of sodium and absolutely no trans fat or dietary cholesterol. Not a bad line for such a tasty and store-bought item. Plus, they were far cheaper than those more-prominent and less healthy other pizza crusts. Boboli anyone? But the key to making these into a shining dinner was adding a few quality ingredients to the mix. These added taste, depth and sparkle to the crusts that really made them shine. I brushed the crusts with an extremely thin layer of high quality extra virgin olive oil to help them crisp and add some beautiful flavor, and then sprinkled a tiny pinch of sel de guarande to add a little texture and marry all of the flavors together. I used a ladle of my favorite jarred tomato sauce (a spicy red pepper marinara sauce) for the sauce and some chopped onions and sundried tomatoes for some flavor-packed toppings. Finally, I finely grated some extra sharp cheddar cheese and put a small handful atop each pizza. 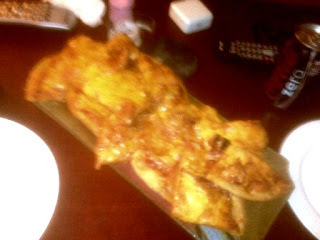 I baked the crusts in a 450 degree oven for 10 minutes until the crusts were crisp and the cheese browning and bubbly. And the resulting pizza was absolutely delicious. In less than 15 minutes, start to finish, we got pizza that tasted no less than gourmet. We gobbled as much as we could alongside a little salad, and we still each did not even eat one personal crust's worth. So those crusts certainly aren't skimpy either. The most wonderful part is how crispy and golden the outer crust became while the inner part was still chewy, providing that satisfying “real pizza” quality. These are surely to become a staple for us now. Because what could be better than cheap, easy and healthy pizza? Can't think of anything.